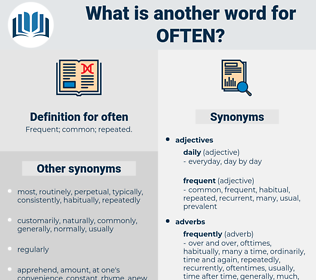 What is another word for often? sometimes, usually, generally, typically, normally, repeatedly, regularly, infrequently, occasionally, ordinarily, seldom, routinely, rarely, invariably, traditionally, widely, constantly, consistently, customarily, habitually, largely, very, extensively, predominantly, mainly, even, quite, periodically, easily, likely, uncommonly, many, significantly, almost, increasingly. Tended, reported, used, Happened, focused. Yes, I have been here before - and I shall be here often.